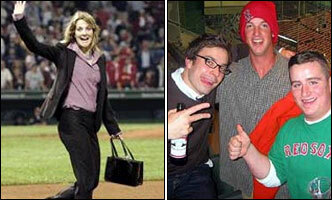 Many local folks were able to get up close with Drew and Jimmy during the filming of "Fever Pitch." The film is an effortlessly entertaining romantic comedy made for many women in Boston. Stow resident and Yawkey League player Dave Mitrou (background, right) plays a pitcher in the film. Perfect ending for Sox, Farrelly bros.